It’s always recommended that the groom buy his day ensemble instead of renting. This way you can ensure a quality tailored fit and keep the look for a usable keepsake for years to come. And for those that are steering away from the tux, a three-piece suit is an elegant, beautiful option for your handsome beau to try. We made things a bit easier for everyone and did a little shopping for you. 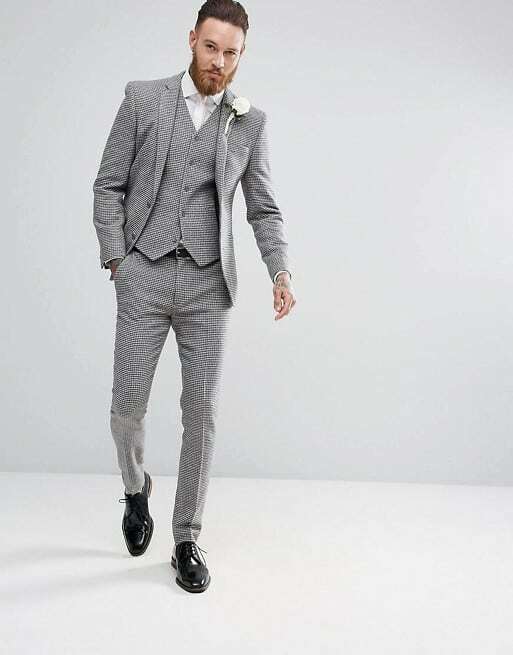 Below, you’ll find 8, stunning three-piece suits that are perfect for your dashing groom. From midnight blue or blackest black, there’s something for everyone’s event. Scroll and find your favorite! First up is this DKNY, crisp beauty from Men’s Warehouse. It’s a deep charcoal that will fit a variety of events, including formal affairs. And it’s got a subtle texture to spark extra interest and create a more contemporary look. The something blue on the bride’s wedding day could be the groom! And with this Michael Kors masterpiece, who wouldn’t want it to be? It’s crisp, it’s class, and will become a timeless piece of your memorable photographs. A bit pricey, but worth the splurge, this suit is a true beauty. Made with 100% woven wool from Italy, its deep navy finish will provide a classic, but a modern accent to the overall day’s look. Mix and match the vest addition. Our biggest splurge on the list is this Tom Ford design you can snag at Neiman Marcus. Everything about this sharkskin suit is stunning. And it’s Tom Ford’s signature base, meaning it’s a look that won’t ever go out of style. I bet you didn’t know that ASOS offered up such beautiful and afforded suits – let alone three-piece designs! This soft gray tone with its slender silhouette could be perfect for your summertime affairs or even your winter wonderland visions. And seriously, look at the price tag. You’re getting a quality look for a fraction of the cost. Taupe is a great color to go for when you want something more casual or you’re feeling a more rustic event. This Ralph Lauren suit will give those kinds of wedding days the polish it deserves. A shade like this is great for outdoor events as well, spring and summertime in particular. Here’s another blue beauty that we’ve fallen in love with. It’s probably the most fashion-forward on the list but also one of the chicest as well. For youthful events and formal affairs, this is one to take a definite peek at – it comes in a black as well! And finally, we leave off with this Kenneth Cole suit. It’s a slimmer cut so it follows the trends nicely and it’s a navy that fits between the lines of black and charcoal making it a more versatile style to choose. The fabric also has a bit of stretch for more comfort!